Many thanks to Laura for letting me share my interesting weight loss experience with you. We have all faced that moment with weight loss. That one where you throw your hands up and say, “I have had it!” There may be tears or anger or stomping around, but it comes to nearly all of us at some point. My moment came two weeks ago as I realized I had been struggling to lose the same 5 pounds for over three months with no success. Don’t lie, we have all been there. I realized it was finally time to get serious and execute a plan. As I have had much success with Weight Watchers in the past, I turned there first. However, when faced with a $50-$60 price tag for 5 measly little pounds, I said “No!” More than $10 for each pound? 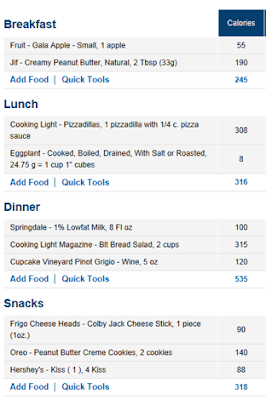 I opted instead for the FREE MyFitnessPal, thinking that curbing calories and writing things down would be almost like Weight Watchers. And it was free! Armed with a target of 1520 calories per day, I set out and documented everything I ate for five days. I was rocking this. I found that I didn’t even need to adjust my daily diet very much to stay under the goal. Then after day five I hit a horrible realization. The scale wasn’t going down. No not in the least. It was actually trending in the other direction. I sat down and had a good pout before I let my engineer brain take over. I had always lost on WW, but what was I missing here? Unless my body was seriously wacked out, something with the system was wrong. I bit the bullet and signed up for Weight Watchers again. (Can I explain how desperate I was to lose this weight?) I plopped down $60 for a three month online subscription. MFP told me this was 1,414 calories, well under my goal of 1520. WW had given me a daily target of 27 points, with a weekly allowance of 49 extra points. When I gave WW my diet for that day, it calculated 42 points! For that day alone!!! I was eating like this nearly everyday. 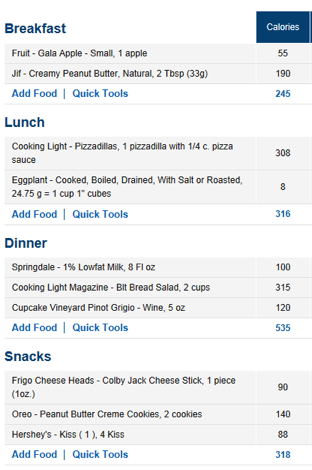 As I extrapolated, I realized that I would have used 294 WW points in a week eating this way. WW was giving me a max of 239 points. No wonder I was still gaining weight! I realize that for my diet, WW’s multivariable approach (fat, protein, carbs, and fiber) for evaluating your diet works much better for me than just tracking calories. Now that I switched, I can already tell the program is working. I am making much better food choices by adding more fruits, veggies and protein into my diet, and my clothes are starting to fit better again. Your weight loss journey may take you to a different solution, but mine has left me square in the arms of WW once again. Thank you Mel! It appears I'll be checking out my local Weight Watchers office soon. I had the exact same experience on WW versus just plain calorie counting! I never, ever lost just counting my calories, but when I finally gave in and paid for three months of WW, I was able to lose the 9 lbs. that had been driving me batty. It's a system that really does work.